Gov. Jerry Brown has known for some time that Californiaâ€™s Prison Realignment was unlikely to bring overcrowding within the CDCRâ€™s facilities in line with the SCOTUS ruling in Brown v. Plata. 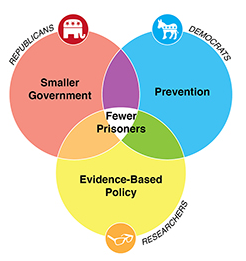 When Justice Kennedyâ€™s majority opinion upheld the three-court decision requiring the CDCR to bring down overcrowding from 175% to 137.5%, the State correctly identified that relieving the pressure in the chamber could be achieved in many ways: it could build more prisons; it could invest in smart and effective probation measures; it could tinker with the sentencing rules; or it could mobilise county facilities to do jobs that were historically reserved for the state. It ultimately settled on the fourth option. The stateâ€™s effort to transfer inmates from state facilities into county jails was a move of legal and political ingenuity. It enabled the Governor to assure citizens that he wasnâ€™t releasing offenders, as Alito had forewarned in his dissent to Brown v. Plata, and it evaded having to raise vast amounts of money to build new prisons, thus protecting Brown’s re-election prospects for 2014. But Realignment has been, at best, playing at the margins. 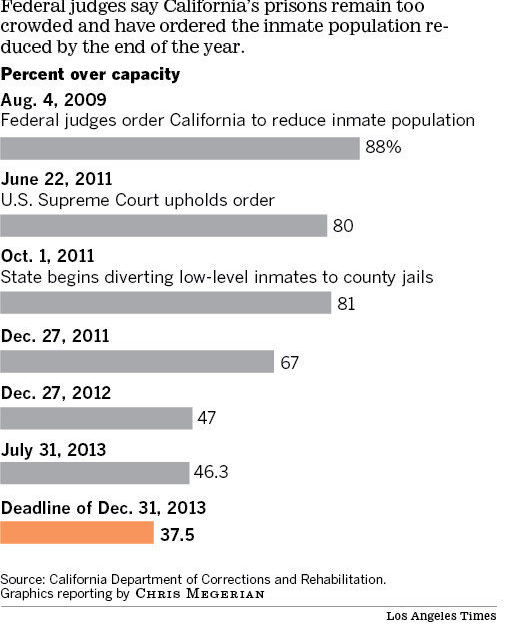 To be sure, the margins in Californiaâ€™s prison system are huge, and the effects are already visible. Indeed, the recent reductions in the US prison population have been largely spurred on by Californiaâ€™s recent re-arrangements. 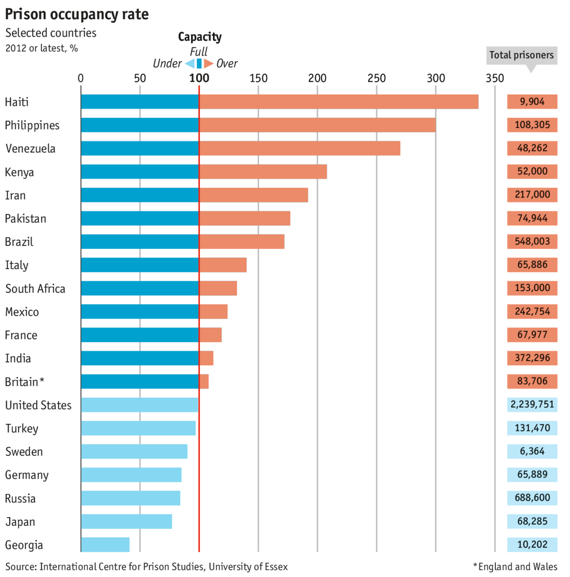 The Economist even featured a graph this week that suggested the total US â€˜prison occupancy rateâ€™ (a measure of the number of inmates relative to the number of prison beds) was below 100%, meaning within capacity. Unfortunately, a cursory search through the source material at ICPS failed to provide sufficient information with which to verify the statistic for myself, or examine any trends in the data. If true, however, Iâ€™d hazard the guess that before Californiaâ€™s recent Realignment, the US occupancy rate would have been in excess of 100%. The progress made in California thus far seems to have stalled. Brown claims to have exhausted all reasonable measures to move inmates between correctional facilities within the state, and any further measure would make Alitoâ€™s nightmare of thousands of feral offenders loose on the streets a reality. According to the L.A. Times, the CDCR has displaced inmates to county jails almost to the point of rupture, and it is considering relying on imperfect facilities such as low-security detention centres, fire-fighting camps, and facilities in other states. Nonetheless, last week the Supreme Court refused to acquiesce to Brownâ€™s assurance that the CDCR had reduced overcrowding to levels sufficient to comply with Brown v. Plata. An offender release thus seems inevitable given the political realities. However, the strategy underlying the implementation of Realignment attests to Brownâ€™s reluctance to take politically bold steps â€“ even if those steps require surprisingly little audacity when viewed against the scientific evidence. If a large-scale release happens, in all likelihood it will begin with the elderly and the infirm. This might bring the overcrowding problem in line with Brown v. Plata. Italy currently has one of the worst records of prison overcrowding in Europe (the occupancy rate there is well over 140%). The Italian Senate ruled on Thursday that they will be cutting pre-trial detentions and will use alternative punishments for minor offences. Venezuela will place 20,000 (40% of the total prison population) of its lowest risk, minor offending inmates on conditional release. South Africa intends to dismiss the probation or parole sentence of 20,000 offenders, and grant pardons to a further 14,600 prisoners. Releasing huge swaths of Californiaâ€™s prison population, as has been done in Venezuela, would be imprudent. But Brownâ€™s reluctance to entertain the idea of offender releases, except as an absolute last resort, shows his inability to recognise just how modest Realignment has been. Mike Konczalâ€™s piece from the WaPo linking the economy with declines in the prison population caught my eye, too. Rather than echoing Keithâ€™s point about the manifest falsity â€“ or methodological futility, for that matter â€“ of establishing the association, Iâ€™ll highlight a different aspect of the story. In the five years since the economy tanked, thereâ€™s been a recognisable shift in the way people talk about justice policy. The Urban Instituteâ€™s John Roman put together a nifty graphic that illustrates how the policy recommendations of various interest groups have aligned in light of recent fiscal instability. Ask the voters to require that the UC system get at least half what the prisons get. It would pass in a landslide. The University of California system is one of the great miracles of public management. Berkeley, UCLA and UC San Diego are all among the top 20 universities in the world; UCSF is one of the great medical centers; if Santa Barbara or Davis or Irvine were a flagship state university, it would be way better than most of its peers; and Santa Cruz, Riverside, and Merced are all more-than-respectable institutions. Aside from Berkeley, all of this greatness is the product of the past 60 years. And we’re blowing it. The next round of budget cuts and tuition increases – the one that will follow the likely defeat of Proposition 30 – will be intolerable. And even if Prop. 30 passes, that provides a torniquet, not a transfusion. As Al Carnesale predicted, our ambition will slowly sink from being among the greatest universities in the world to being among the best public universities in the country. Financially, we will move – as other systems have – toward a publicly-owned set of self-supporting (in effect, private) universities, with much less access for the poor. The State of California shall not in any year spend more on its prison system than on its universities. Funds appropriated for the University of California shall not, in any year, be less than half the funds appropriated for the California Department of Corrections and Rehabilitation. This year CDCR will spend about $9B, and the appropriation for the UC system is $2.2B, scheduled to be cut back by about $500M after Prop. 30 goes down. So the proposition would more or less double state funding, which would allow some recovery of quality and a reversal of the huge tuition increases of the past few years. I’ve been pushing some version of this for about three years now, and my colleages get all goo-goo on me and refuse, on principle, to discuss the idea. After all, they say, government-by-proposition has ruined California. Well, so it has. But if the institution is worth defending – which I fervently believe – then this is one of the times when we must rise above principle, and just do what’s right. Who should pay for whose college, and how? Years and years ago, David Mundel used to provoke my interest in public policy as an object of analysis (rather than an occasion to opine) by suggesting out-of-the-box things like: the way to deal with affirmative action and discrimination in college admissions is to require colleges to admit by lottery and have done with it.Â This appears flatly nuts until you realize that under such a scheme, applicants would have a strong interest in choosing schools whose academic demands matched their abilities, because there’s no point in getting into a place you will just flunk out of as a freshman, and colleges would have an interest in providing the information with which applicants could choose intelligently, because there’s no point in admitting someone who can’t cut it. I’m still not ready to completely sign on to this idea, but it has a lot going for it. It certainly beats the uninformed grasping for prestige that college application season has turned into. David, IIRC, also favored charging full costs in tuition with an extensive loan program, because all college students are pretty rich on a lifetime income basis no matter what income their families have, and not being able to afford college is simply a capital market failure that should be fixed directly. Tuition subsidy at the University of California, on this model, is a Hood Robin transfer from everyone to the upper third of the income distribution. Author Michael O'HarePosted on March 2, 2012 March 2, 2012 Categories UncategorizedTags Britain, California Politics, Education policy, Medicare, Policy briefs, University of California30 Comments on Who should pay for whose college, and how? Following our debates here about the price of marijuana, I thought I would flag for people’s interest this piece by Michael Montgomery. His reporting indicates that after dropping lower than $1,000 pound ($62.50/ounce), Northern California prices for the latest harvest have now rebounded to $2,000-$2,500 a pound ($125-$156/ounce). I suspect normal market forces, bad weather and mold drove most of the change. The article suggests that law enforcement was influential as well by leading some growers to cut back on their crop. Possible, but it also led some dispensaries to close, which would have the opposite effect on prices (i.e., fewer dispensaries chasing grown crop would lower prices). 1)Â Give Liu a recess appointment to the Ninth Circuit.Â This will last until the end of the current Congress.Â With more than a year and a half of experience on the federal bench, Liu will have more judicial training than John Marshall Harlan, Clarence Thomas, or Elana Kagan.Â Temporary Article III judgeships are going to be more and more common as long as Senate Republicans have decided to make the Senate dysfunctional.Â (It’s bad for the judiciary as an institution, but the GOP doesn’t care about institutions.). 2)Â Prevail upon California Governor Jerry Brown to appoint Liu to the open seat on the California Supreme Court.Â It says something not-so-great about the legal profession and legal academia that state supreme courts are not regarded as having the same or greater prestige than intermediate federal appellate courts.Â For the most part, state supreme courts have control over their dockets, unlike the federal circuit courts, and they are the last word in their own jurisdictions.Â State supreme court justices elevated to the US Supremes have a pretty good track record — Souter, Brennan, and Holmes immediately come to mind.Â Why would Brown do this?Â Why not?Â Liu would be a highly effective judge.Â And besides, given California’s ongoing fiscal crisis, it would be really good to have friends in Washington high places who owe you a favor. The deficit is about $700Â for every person in California, where per capita income is about $45K. In other words, if the state economy transferred 1.6% of its consumption to the public sector from the private sector, the deficit would be covered with current levels of public service.Â (Another 1.6% and we would have the state Californians used to be proud of – not “the state government”, the state and all the things in it that don’t work without government. )Â Brown proposes about half spending cuts, including some really savage ones, like $3000 for every student in the University of California system, park closings, and breathtaking slashes in things like Medicaid, home health care, and welfare.Â The other half is tax increases, in the form of extensions of temporary taxes enacted two years ago. These are pretty regressive.Â It’s not unfair to describe Brown’s proposals as balancing the budget on the backs of the poor, and the tender mercy with which he’s treating the prison system and its shameless union is notable. He’s also holding K-12 education to the level of harm it’s already endured, which is the shame of the state (for now; if he doesn’t get the tax increases, watch out). He also proposes toÂ transfer a hatful of responsibilities to local government, including one intriguing proposal that county government take over more of the cost of wildfire fighting on grounds that it’s county and local land use decisions, allowing development far into fire zones, that have made firefighting so expensive in recent years. This complicates the discussion, because whatever level of government provides them, they have to be paid for with some kind of foregone private consumption. But perhaps California would be better off with more variation in local government positioning on the high-tax,high-service and low-tax,low-service scale. The Republicans are reacting according to their vacuous script, refusing to countenance any tax increases and prating in the usual way about shared sacrifice and waste in government.Â Â The California Republican Party long ago lost its tether to responsibility, reality or even humanity, and no-one takes their policy discourse to mean much more than “please, please, don’t primary me in my safe district of rich people who think they don’t need any government.” But they do have their 1/3 plus blocking minority for tax increases. I’m not sure how this will unfold, though it will probably take a couple of years for the cuts to make themselves visible and consequential.Â If the tax extensions fail at the ballot, things will get uglier faster, which might help move things along.Â But what direction they move is not certain; the kind of service Keith reports from the DMV might wake people up, but a lot of the pain will be visited on people who are so desperate they can’t really put a political oar in. It also might just aggravateÂ inarticulate and unfocused government-hating in angry, poorly led, and frightened middle class, and we could wind up in a stable pessimal condition, the Alabama of the west. On the one hand, Brown’s budget’s clarity and honesty is a necessary step toward fixing a broken society; on the other hand, the subsequent steps are not assured.Â It’s scary times.